In the past several weeks, I came across with some old friends and peers from high school and even college and got to talk to them about investments wherein many ask what investments can they delve into. A lot people I ask haven't heard about mutual funds nor heard or have little knowledge of this investment instruments. So I am willing to share some of my knowledge and background on this and made some Frequently Asked Questions or FAQs for beginners who do not know about these golden eggs and what it can do for them in the long run. As a disclaimer, past performance of the mutual funds may vary from time to time and may not result in the expected future yield. What are Mutual Funds? How do this work? What are these financial instruments anyways? Mutual Funds are a type of investments that are pooled together from group of investors and are professionally managed by a portfolio manager. The seasoned manager on the other hand invests the funds' assets in different variety of investments such as stocks, bond or other investment securities or a combination of both stocks, bonds and securities. Net Assest Values per shares (NAVPUs) represent the value of total equity, or it may be divided by the number of shares outstanding and thereby represent the net asset per value of investment. 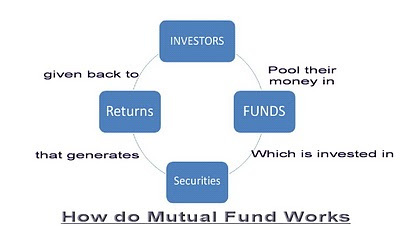 Concept of the mutual funds are seen in the diagram below. 3.) Bond Mutual Funds - are mainly invested in debt securities or treasury bonds issued by the government of the Philippines and also corporate bonds issued by major Philippine companies. There are no guarantees of risks and safety margin in this type of investments, however. I put some summarized information regarding the three types of mutual funds. There are several mutual fund products out in the market to select from. However as I have said in the disclaimer, the past performance of this type investment may vary and depend on the market conditions and are not indicative of expected future returns. Thing to bear in mind before venturing into mutual funds. 3. Management Fees - Paid out of the fund assets, management fees include payments to the investment adviser for portfolio management, any other management fees payable to the fund's investment adviser or its affiliates, and administrative fees payable to the investment adviser that are not included in other categories. 4. 12-1B fees - Covers the expense of providing information to shareholders about their investment through phone, mail and especially the internet as a major channel distribution for shareholders. custodial expenses, legal and accounting expenses, transfer agent expenses, and other administrative expenses. Mutual Funds can be held by the professional managers and company for two years maximum, however early pull out of your investments will have tax and redemption fees charged to your mutual fund account if you wish not to pursue it after a few months as an example or before the given redemption date. Before buying, shop around first and ask for prospectus. Learn the past performances and how well they are managed by their appointed professional fund managers by asking some questions with the selling agent and also checking around information on their websites. As I have said earlier in the disclaimer, Past performance is not indicative of future results or yield of the mutual fund. Remember, every decision you make are very crucial. Planning, learning and preparing are the next necessary steps of your Financial Planning stage in becoming a Financially independent person. Three of the best performing Mutual Fund Management companies are First Metro Asset Management, Inc. (FAMI), Philam Asset Management, Inc. (PAMI), and Philequity Management, Inc. (PEMI). To know more how to invest in these mutual fund management companies, please visit our website, we’ll be glad to assist you. Very informative and elaborate article on mutual funds. Thanks for enlightening us more especially newbie investors. The part on fees being charged investing in mutual funds should take note by readers.